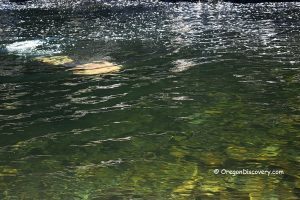 Every nature lover’s dream, Moulton Falls Regional Park is located right at the confluence of the Lewis River East Fork and the Big Tree Creek. This 347-acre park is home to an arch bridge which is higher than three stories and two stunning waterfalls. The heavily forested park sits on either side of the fast flowing river. Various attractions at the park include volcanic rock formations created due to early lava flows, the Big Tree Creek swing bridge and various historic Indian meeting grounds. Furthermore, the Chelatchie Prairie Railroad excursion train also passes via the park. Amongst the key attractions is the Moulton Falls Trail which is an out-and-back hike along the Lewis River. The trail winds via a picturesque footbridge and then towards the right follows along the beautiful Lewis River with a mossy cliff to the left. This hike is ideal for all those looking for a peaceful stroll with a hit of adventure. For the additional challenge, follow the trail to the Big Tree Falls or climb up to the Bells Mountain Trail for an amazingly scenic viewpoint. The path to the trailhead also passes the not to be missed Lucia Falls which is among the region’s most scenic water features. As you approach the end of the trail consider making a stop at any of the local wineries or a relaxing soak in one of the pools along the river. For food, Rocky’s Pizza in Battleground combines delicious food with an eclectic old western setting. The Moulton Falls in Washington State should definitely be high up on the list for every nature lover this summer. 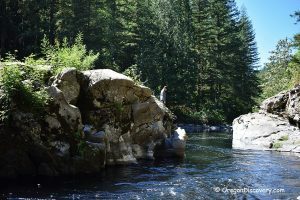 The East Fork of the Lewis River near Moulton Falls is a great and popular spot to cool down on a hot summer day. Large rocks and rock ledges make for the perfect place to sunbathe and enjoy the river. You can find a few excellent deep pools along the river for swimming and cliff jumping. However, the currents are swift and the river has varying water depths making it imperative to exercise caution. 148 miles north of Eugene. Continue for about 8 miles to NE 152nd Ave and then NE Lucia Falls Road to the destination.